This baked potato roll is a delicious one dish meal that can be served both hot or cold. It can be filled with provola cheese and ham but, if you favor a vegetarian option, you can fill it with spinach or zucchini, both are perfect with potatoes. 1. Boil the potatoes for 30 minutes and mash them up with a fork. 2. Add the egg, salt, pepper, butter in small pieces, Parmesan cheese and parsley. 3. Stir until all the ingredients are mixed together thoroughly. 4. Add the breadcrumbs and mix. 5. Move the mixture onto a sheet of parchment paper. 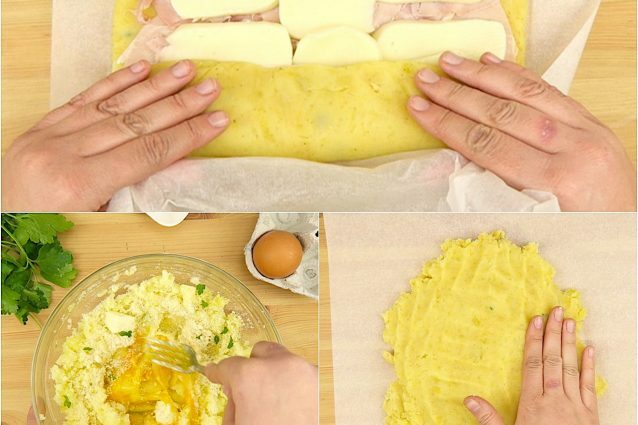 Flatten the mixture with your hands to form a rectangle. 6. Add a layer of ham and one of provola cheese. 7. Roll it up starting from the shorter side, helping yourself with the parchment paper, and seal the sides of the roll. To make a nice crunchy crust, add some breadcrumbs to the outside of the roll. 8. Place the roll in a bread pan and bake at 180°C for 25 minutes still wrapped in the parchment paper. Remove the roll from the oven, remove the parchment paper and let cool. 9. If you want the roll to be even crunchier, set the oven to grill for the last 10 minutes of cooking. You can also use a sweeter stringy cheese instead of the provola. Enjoy! Potato rösti roll: easy, tasty and cheesy!